Last week, Ideal Shield headed on down to (almost) sunny Orlando, Florida, for the 2017 Grainger Show. And, like always, it was a can’t miss event. As an invite-only event, this trade show allows Grainger’s customers to meet with suppliers and learn more about the products they use or need, while also developing relationships with experts in the industry. The purpose of this event is to provide customers with the opportunity to see the newest market innovations, get one-on-one attention to learn how to cut costs, and to keep their businesses running as efficiently and as safely as possible. Our VP, Chris Parenti, and Customer Service Rep, Bindu Abraham, spent the show answering questions and displaying the practicality of our bollard sleeves and sign bases. They showed off the quality and differences in our bollard covers and why the company, who invented the dome top, is always the best choice when it comes to trusted and tried plastic bumper posts. But it wasn’t all business. Chris and Bindu even had the chance to give away our latest innovation, a Mr. Shield mascot, to be used at the Cincinnati Children’s Hospital. It always feels good to hand out some smiles along with an opportunity to network with users from across the nation. 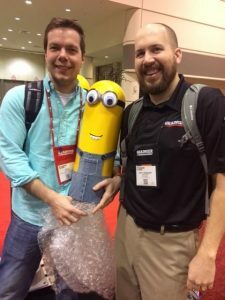 It’s just part of what makes trade shows a fun, unique and productive way to expand and improve the industry. Looking to check out Ideal Shield’s next trade show booth? We’ll be heading to the 2017 Car Wash Show in Las Vegas, NV. from April 3rd-6th, Las Vegas (booth 2539). So, if you’re in town and looking to check out the latest products and inventions from Ideal Shield, stop by and say hello!